Nathalie Johnston is the Founder of Myanmar Art Resource Center and Archive (MARCA). Her gallery in Yangon has featured young and upcoming street artists whose paintings and installations have challenged audiences to see Buddhism through different lenses and scenes. She developed an interest in Buddhism during her extended stay in Myanmar. Her deepened understandings of the philosophy mainly come from her research work, reviews, translations and mundane observations. She is greatly inspired by the acclaimed visionary artist called Po Po, who brought something truly new in concept and execution to an isolated country’s latent art scene in the 1980s. 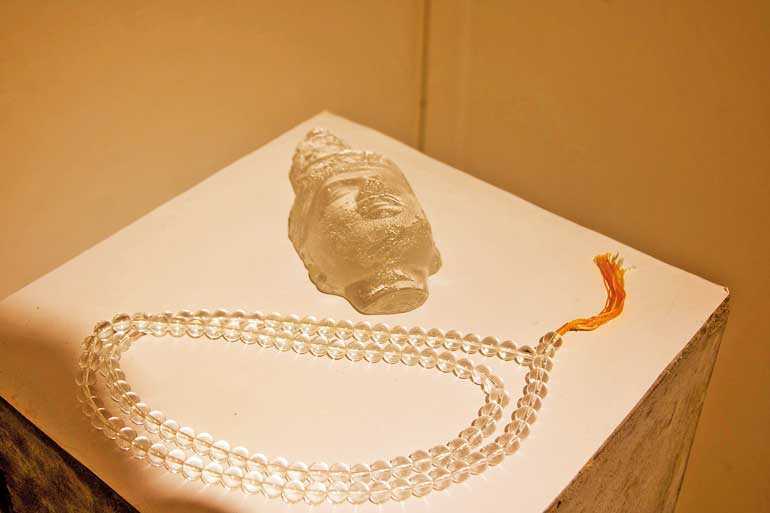 Theertha Red Dot Gallery in Borella hosted an exhibition featuring Myanmar’s contemporary art last week. 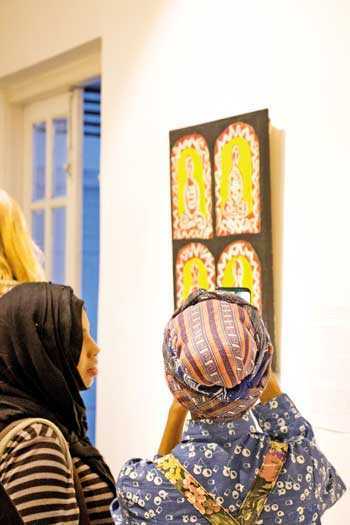 The event was curated by a local independent artist and an art historian with the purpose of fostering artistic exchange between Myanmar and Sri Lanka. A conversation on Myanmar’s contemporary art scene by Nathalie Johnston was held on 4 January at the gallery, bringing likeminded individuals to engage and explore the roots of Burmese art. Myanmar’s art is synonymous with Buddhism. Pagodas, Buddhist temples and monks are metaphors of what the country is today. “Seeing hundreds and thousands of monks walking through the streets, collecting alms, is an everyday occurrence in Myanmar. Buddhism is deeply entrenched in their art as a devotional practice. 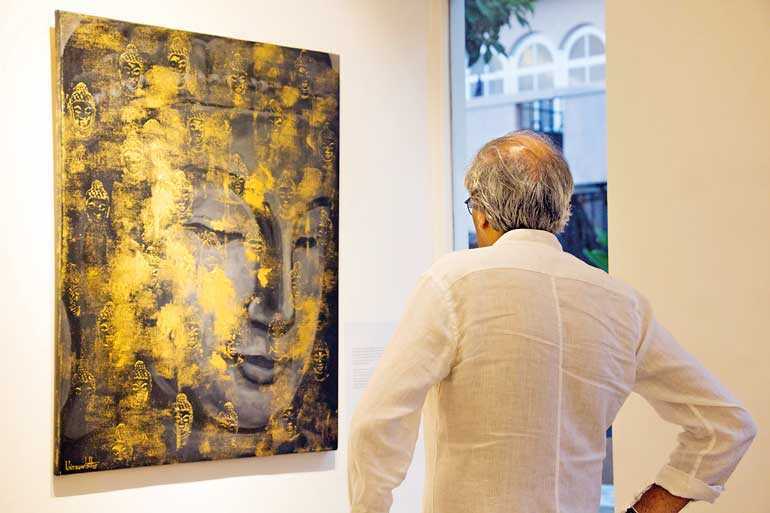 The artists create art that honours the stories of Buddha and paint anything that channels this idea of Burma as a Buddhist country that represents a sense of belonging, peace and nationalism. “Having lived in a predominantly Buddhist country for many years and read almost all the books on Myanmar art, I have become observant of the overpowering Buddhist symbolism in its art scene. 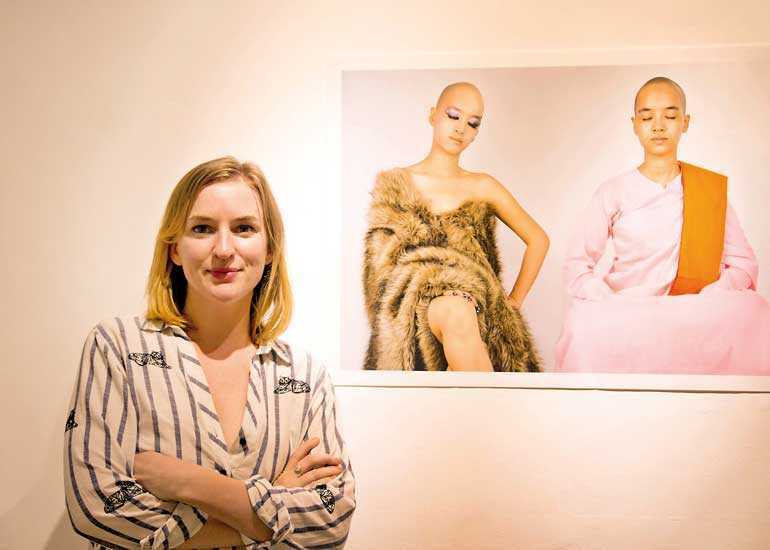 It is interesting to explore the modernist take of it,” said Nathalie, portraying the prevalence of Buddhism in Myanmar’s everyday life in her presentation. While exploring Yangon’s burgeoning art scene, Nathalie went back in time, taking us through a transition of Myanmar’s artistic community from the 1970s to the present. She delivered a pictorial account of how art changed with the revival of realism and the establishment of an independent government while having parallel lives – espousing socialism as a way forward. When Buddhism was declared as the national religion, a distinct identity was determined as the essence of Myanmar. When Burmese artists were politically isolated over the last 50 years, art was used as an expression of their fight for liberation. 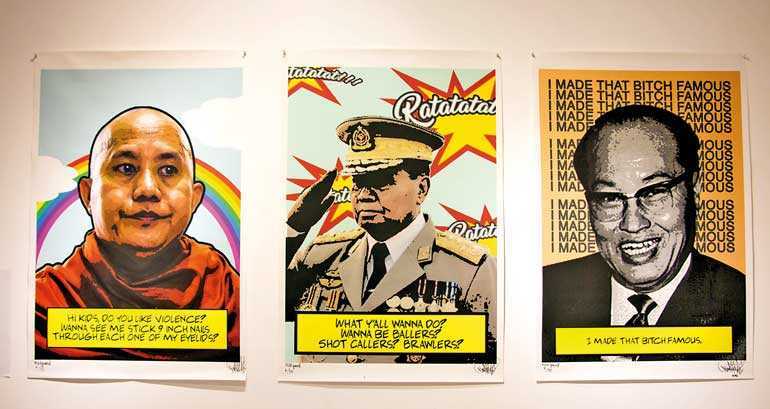 Burmese art went through a revival after 50 years of censorship and monks became a political symbol of democracy during the Saffron Revolution in 2007. Amidst a civil war, ethnic tensions and protests between the people, military and monks, art still continues to survive and thrive in Myanmar. Speaking of the new wave of art in Myanmar, Nathalie mentioned how the younger generations of artists tend to address the contentious issues of the country with humour and sarcasm. Since the last decade, young artists have been forging new grounds with their art, going beyond the confines of their political, cultural and social milieu. During her talk, Nathalie also acknowledged the long history of the shared Buddhist heritage between Sri Lanka and Myanmar. Sandev Handy, who is one of the co-curators of the exhibition, facilitates dialogues on socio-political issues. He finds an uncanny similarity between Myanmar and Sri Lanka in its incredible forms of Buddhism that epitomise peace, giving and charity.